When a woman finds her unique and love-driven purpose, she becomes an unstoppable force of nature. My client, Ilana Nankin is the living and breathing example of what happens when a woman receives her purpose from the Universe with grace, power, and fearless rigor. A year ago, I wanted to drop my Ph.D. program because I didn’t believe in myself as a writer, felt lost in my career, and disconnected from my community. With Chrissy’s support, I found my voice as a scholar, and created the dissertation project of my dreams which now serves as the foundation for my life’s work. Through our ongoing sessions, Chrissy helped me get extremely clear about what I wanted for myself and my life, and what was stopping me from pursuing this path. By embracing, rather than running away from my fears, I found my authentic voice and purpose as a leader, educator, and entrepreneur, and became an unstoppable force. I found my vision and designed my entire life around fulfilling it. Now I am the CEO and Founder of Breathe For Change, an organization that improves the health and well-being of students, teachers and communities through yoga and mindfulness. Breathe For Change’s mission is the exact vision I created for myself through my sessions with Chrissy: to change the world, one teacher at a time. Now, I am living and breathing that change. Today I have the inner strength to stand for others to breathe their change, just the way Chrissy did for me when I could not do so alone. Are you blown away by this woman?? She didn’t let her fears stop her, instead she followed them like a torch out of the darkness and into the light. She could have quit her Ph.D. program and taken the easy way out, but instead she created a new possibility using her engine of creation: DESIRE. Throughout our time together, she got crystal clear on her passions for yoga, children, education, social justice and community. She then combined those joys to create a dream business that empowers children and teachers alike to experience mindfulness and yoga in their everyday lives. Her joy, not her stress, carried her throughout this business building process. What makes Ilana such a successful superstar? For one thing, she has mastered the art of asking for what she wants. Ilana has never- ever- let anyone stop her from achieving her dreams. If someone says no, she doesn’t take it personally or feel any sort of rejection- she moves on and asks more people for help. She also takes action ferociously and avoids the dramas of procrastination and complaint. She doesn’t get flustered by the in betweens of business building, she simply takes action. Even in the face of painful family circumstances, breakups, and emotional pain, Ilana kept fighting. She has the Queen’s mindset of no-excuses. Her actions, big and small, lead to big wins! 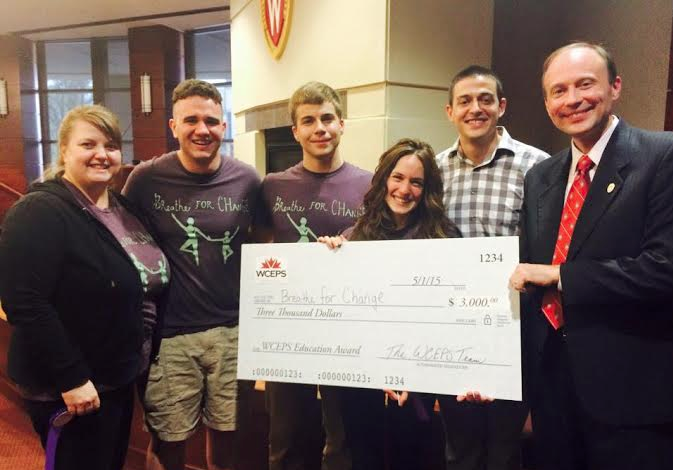 In the picture below, you’ll see the funding her team won to support the launch of her company! What exactly is Breathe for Change?Breathe For Change provides educators with comprehensive and accessible yoga teacher trainings grounded in pedagogical practices that promote social justice and equity. Her company trains educators in powerful mind-body practices to create a more just and peaceful world. Find her company Breathe for Change on Facebook or Twitter. And if you’re feeling generous, you can donate to her program at Go Fund Me. Major congrats to Ilana Nankin, the change-maker our world has been waiting for. P.S. Ready to build your own business centered around your joys and passions? Reply to this email and let’s set up time to talk! You don’t have to remain stuck in a job that you hate, you too can create a business that you love just like Ilana. I know the feeling of having no idea where to start- I was so overwhelmed at the start of my business! Have no fear, because my team will help you from start to finish of building your business, we even build your website for you! Reply to this email and learn how to get paid for your purpose- it’s that easy.